I really cut back on book reviews, because my reading schedule varies so much now, and I hate to have to read a book just because a review is due. So, that being said I thought this book looked interesting. 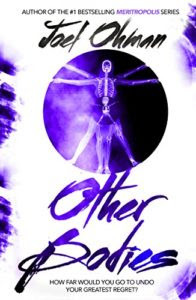 It is, "Other Bodies" by Joel Ohman. I had never heard of this author before, but thought I would give it a try. Joel Ohman lives in Tampa, FL with his wife Angela and their three kids. His writing companion is Caesar, a slightly overweight Bull Mastiff who loves to eat the tops off of strawberries. Joel is the author of the #1 bestselling Meritropolis series—“The Hunger Games meets The Village with a young Jack Reacher as a protagonist”. Joel is a Christian, CEO, CERTIFIED FINANCIAL PLANNER™, author, angel investor, and serial entrepreneur who loves creating new things, whether books or businesses. He is the founder of a number of web startups and currently serves as the CEO and lead operator of 360 Quote, a private equity backed platform company in the online lead generation space, the co-founder and CEO of a B2B SaaS software company, Exercise.com, and has also previously served as the founder and resident CFP® of a national insurance agency, Real Time Health Quotes. If you enjoy Veronica Roth, James Dashner, or Suzanne Collins then this is the story of the year you won't want to miss. BUY NOW. I honestly was not sure if I would like the book after I started. This book is designed for teens, and honestly, I am not. That being said, I personally would not recommend this book for Christian families who are raising their children with a Christian mindset, unless you read it yourself first. It is probably darker and covers some themes you may not want to expose your teen to. Now, I did finish the entire book, and feel that it covered many of the vary situations we are facing in today's society. Hattie made a choice she ends up deeply regretting, but it is too late. I personally do not care for this style of writing, and honestly do not consider it an openly Christian book. I feel that those outside the Managed Motherhood were typecast as not normal. Overall I was more impressed than I thought I would be, but still this is simply not my type of book. I am reading this and find it hard to get into asking I am a Christian and find it a hard read. Having been through a teen pregnancy myself, I know the heartache and pain involved in choosing life and being looked at like you did something wrong... I was raped and became pregnant. I thank you for your take on this and sharing your thoughts, it was helpful to me.